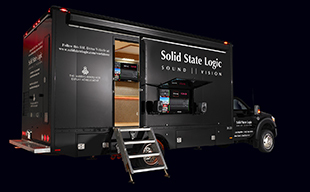 NEW YORK  Solid State Logic is proud to announce its newly completed Broadcast Equipment Demonstration Vehicle has set out on a non-stop tour of the United States and Canada. The tour began in San Antonio, Texas on Feb 1, 2012 and will continue onwards for the next three years. The custom designed mobile production vehicle features SSLs C10 HD Compact Broadcast Console and associated routing and I/O solutions in conjunction with all of the key audio and video monitoring and communications systems required for a modern broadcast production facility. Housed in a Russ Berger designed acoustically accurate space, the vehicle enables potential clients to have hands-on experience of SSLs on-air audio production technology right outside their front door. The SSL Broadcast Equipment Demonstration Vehicle, designed by SSLs Project Engineering team, was built on a 2012 F550 Ford chassis with a custom body and was crafted by leading mobile vehicle specialist Shook Mobile Technology. Russ Berger Design Group (RBDG) provided the acoustic design for the space using both absorbing and diffusing treatments as well as SpaceCoupler technology for the ceiling. The vehicle is presented in association with SSLs technology partners: Genelec, Miranda, RTS and Savant. The truck demonstrates the capabilities of all of these systems and the integration that is possible between them. The mobile control room space is completely climate controlled, sound isolated and treated to provide a comfortable and acoustically accurate demonstration environment. The space can accommodate several people and a larger group can watch demonstrations from outside the vehicle via an external audio monitoring system and video display, which is linked to internal cameras. The audio monitoring system inside the vehicle is a complete Genelec 8020.LSE Espresso 5.1 system, which consists of five Genelec 8020B two-way, bi-amplified active monitors matched with a Genelec 7050B LSE Series Active Subwoofer. A pair of 6010A Bi-Amplified Active Monitors for PFL (pre-fade listen) and a pair of 8030A Bi-Amplified Monitors for the outdoor display round out the audio system. A Miranda Kaleido-X16 multi-viewer offers high quality and space efficient monitoring with silent operation, and Mirandas Densité processing offers simplified signal management using multi-functional modules. An RTS Adam-M system with two key panels is employed for intercom, while a Savant True Image interface handles the vehicles lighting and video switching. The SSL Broadcast Equipment Demonstration Vehicle will visit local U.S. broadcasters, houses of worship, systems integrators, key sports and entertainment events, as well as being showcased at trade exhibitions. The schedule for 2012 begins with demonstrations in Texas, moving on to locations in New Mexico, Arizona and California, stopping in Las Vegas for the NAB Show in April, on to Utah and then the Eastern Seaboard.